FACT: Most violent crimes occur in poor neighborhoods populated by minorities. FACT: Democrats consistently & overwhelmingly vote against allowing poor inner city Americans to arm themselves against the thugs who prey on them. FACT: School children who struggle the most, are mostly low income and are forced to attend a failing public school system. FACT: Milwaukee, Florida, Washington DC and Texas, all showed immense improvement using school choice vouchers, yet the Democratic party consistently & uniformly stand with the fat cat union bosses against education reform. 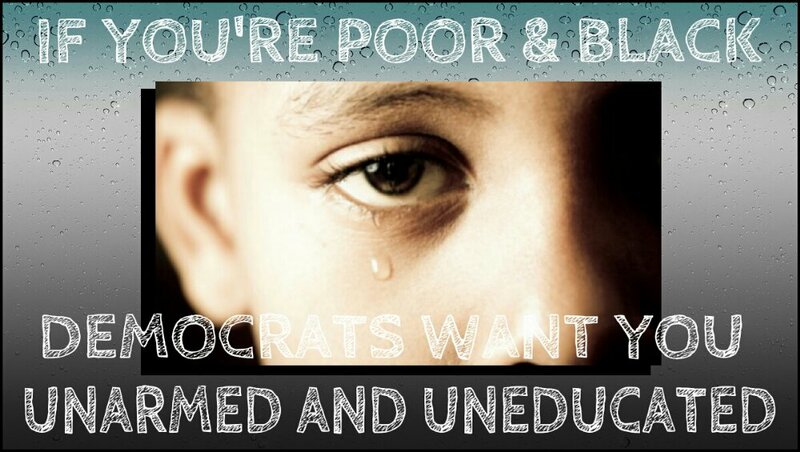 CONCLUSION: If you are poor and black, the Democratic party wants you to be unarmed and uneducated. I don’t think I have room, or even need to list all of the Democratic gun control legislations or examples of democratic law makers voting against one’s God given right to defend oneself. Back in the day, gun legislation was a way to keep free slaves from gaining any kind of power. Now African Americans are being told to continually vote for politicians that want to keep them unarmed, uneducated, and dependent on the government. African Americans also need to understand the truth behind the history of the parties and how Democrats have tried to keep the black community out of power. They also need to recognize that the Second Amendment is a right and they should be active participants in it. I openly support the African American community in educating their children and defending their lives, their liberty and their property, may God bless America!